A message from Melody Clark, the WiLS Service Specialist for the Wisconsin Digital Library project. Some of you may have read about or received an email similar to the one below regarding Overdrive’s new Get a Library Card feature. This feature offers new patrons an option to validate and gain access to OverDrive. However, this option is currently available for stand alone libraries and is not available for consortium yet. When this feature becomes available, the WPLC Steering Committee and Board will review the options and determine whether or not to implement. 160 million. That’s the number of people in the United States without a library card. As libraries like yours transform to better serve their communities, half the nation has yet to discover and benefit from their valuable programs and online services available for free, anytime and anywhere. That’s why we developed the Get a Library Card (GLC) feature: To connect readers with your digital collection in just 30 seconds. It’s another way OverDrive is helping libraries reach and engage more of their communities. Complete the form below to let us know that you’re interested in adding GLC to your library. When your library enables GLC, users are presented with the option to get access to your digital collection using their mobile phone number. Users see a prompt on the log-in screen of your library’s OverDrive-powered website and in the OverDrive and Libby apps. Your library just needs to provide us with a list of zip codes to define your service area. Users provide their name and mobile number, and OverDrive looks up their address using a third-party service called Cognito. If their recent address matches a zip code in your library’s service area, we issue them access to your digital collection using their mobile number to sign in. Before we issue access using a mobile number, we send a one-time code via SMS. This ensures that only someone in possession of the mobile device can use that number to register. Libraries manage new sign ups in an OverDrive-hosted portal called Library Card Manager. Libraries are provided with the mobile number, name and address that are used to verify each user’s eligibility, and can use this information to reach out and invite them to sign up for a full library card. 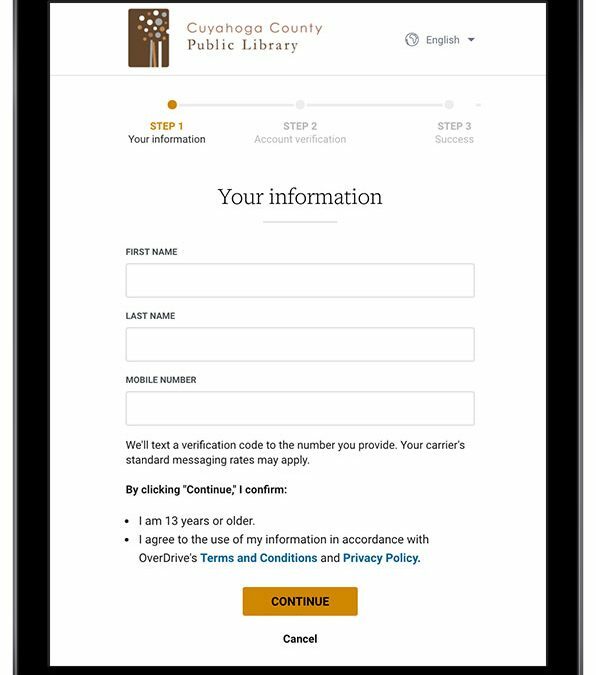 Access issued to mobile numbers has an expiration of one year, but this will be customizable by libraries in the future. GLC is currently in pilot across the country, and we’ll be opening it up to other interested U.S. libraries soon. Complete the form below to let us know that you’re interested in adding GLC to your library. Our team will follow up soon with more details. Please contact your Account Specialist for more information.